Posted January 26th, 2014 by Lisa & filed under farro, peas, prosciutto, the lighter side. Far be it from me to try to upstage Daft Punk in their robot gear on Grammy night, but it *is* Sunday, and this is when I typically do my best work in the kitchen. 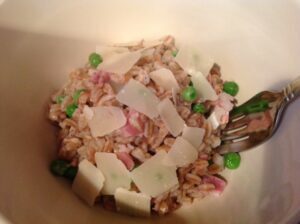 You see, for the past three weeks, I’ve been following the “week in a day” plan, and it’s been working so well, I couldn’t wait to share my latest creation with you: Farro with Prosciutto & Peas. What’s “week in a day,” you ask? Basically, it’s when you do all of your cooking for the week on Sunday. I love it — not only because I know there are healthy meals waiting for me in the fridge when I get home late from work — but also because I only have to clean up the mess of cooking once. Trust me, it’s a big time-saver. I’ve been a bit obsessed with farro lately. Haven’t tried it yet? I like to think of it as a cousin to barley. (I do love me some Beef Barley Soup. Hmm, note to self in planning next week’s menu?!) Farro is light and nutty, and can be served hot or cold. And, since I love prosciutto and peas over pasta as a quick meal, I thought, why not use farro instead? It.Was.Genius. The hardest thing about making this recipe is finding farro. My neighborhood supermarket doesn’t carry it. But, of course, Trader Joe’s does — the quick-cooking-in-10-12 minutes-kind, no less. Once this dish came together, I opted to drizzle a bit more olive oil over top and sprinkle on some shaved parmesan cheese. Honestly, for a really quick, easy and healthy weeknight dinner, it doesn’t get much better! 1. In a medium saucepan, bring approx. 3-4 cups of water to a boil. Add quick cooking farro and boil for 10-12 minutes or until the farro is soft. Drain and set aside. 2. Add 2 tbsp. of olive oil, the diced onion and crushed garlic to a pan. Saute until the onions are translucent and the garlic is fragrant. Add the prosciutto and cook until no longer pink. Add the peas and the wine, and cook until peas are heated through. 3. 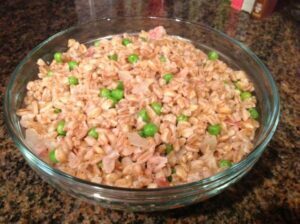 Add the farro to the pan with the prosciutto and peas. Season with salt and pepper to taste. Add the remaining tablespoon of olive oil, and mix until all ingredients are combined. Serve topped with shaved parmesan and an extra drizzle of olive oil, if desired.